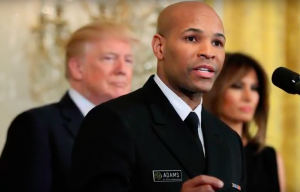 “We should think of naloxone like an EpiPen or CPR,” says Surgeon General Jerome Adams. The U.S. Surgeon General last week issued a rare national advisory urging Americans to carry the anti-overdose drug naloxone. It was the first national public health advisory issued since 2005, when the then-surgeon general warned of the hazards of drinking while pregnant. Since 2010, the number of opioid overdose deaths has doubled, according to federal figures. Currently, more than 2 million people in the U.S. are battling an opioid use disorder, the surgeon general’s statement said. “We should think of naloxone like an EpiPen or CPR,” Adams told NPR. Naloxone is a drug available as a nasal spray or injection to temporarily reverse the effects of an overdose. Every state in the nation has passed laws to boost naloxone access, and many now dole it out in pharmacies without a prescription. Although the drug can sometimes cost upward of $100, it’s often covered by insurance, USA Today reported. “To manage opioid addiction and prevent future overdoses, increased naloxone availability must occur in conjunction with expanded access to evidence-based treatment for opioid use disorder,” Adams said. Specifically, the surgeon general recommended that friends, family and anyone at risk of an overdose consider carrying the life-saving drug. The move represents a fresh embrace of harm reduction principles, at a time when others in the federal government have trumpeted War on Drugs values. Last month, Attorney General Jeff Sessions issued a controversial memo urging federal prosecutors to pursue the death penalty for drug dealers. The push came just after President Trump touted the idea at an event in New Hampshire.